Riding a bike is always fun, but when you want to purchase one online, it can become complicated mainly because not every store has a user-friendly design and interface. This Magento 2 theme for bikes and bike equipment can be your perfect solution when building a bike store that people would really want to visit and recommend to their friends. Beautiful, stylish, minimalist and clean, it not only boasts impressive design, but comes with a load of features that could increase your store's potential and make it super easy to browse your inventory. The template includes a several number of layouts and component variations so that you can customize it and adjust as you see fit. Choose from 5 header options, 4 product listings layouts, 3 product layouts, and 5 footers. You can also select 3 home page variations and pick one from 4 pre-designed color schemes. 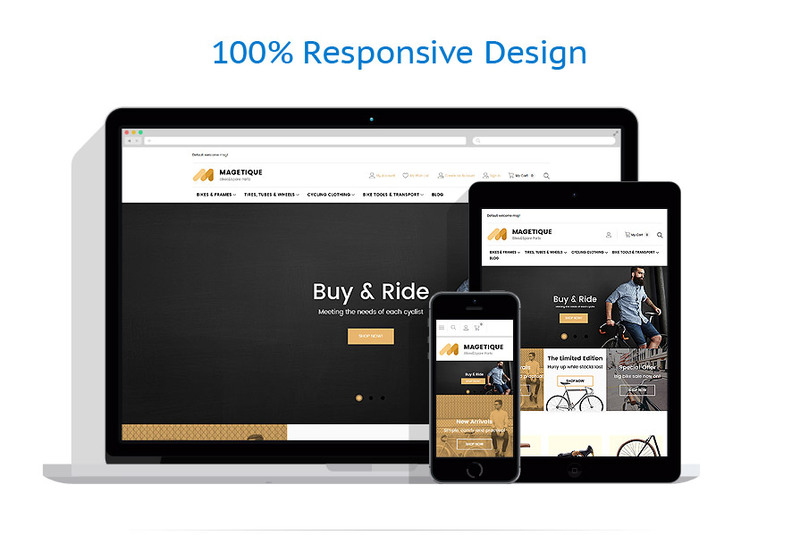 Try out the bike Magento 2 theme today and make your shop awesome.TemplateMonster MarketPlaceTemplateMonster is a marketplace where you as a designer or developer may sell your Web Design Software, Website Templates, Design Elements, Plugins and Extensions. Become a digital products vendor and earn up to 70% from each sale. This Sport Magento design is Responsive What is it?It is an ability of the website to immediately adapt to any screen dimension and resolution. Why is it Good?Responsive design delivers a better UX for people that browse a site on a mobile or a tablet, and additionally can help to improve rankings of a website in search engine results pages. View more Responsive Magento themes here This Motorcycle Gear Magento ecommerce template is Search Engine Friendly What is it?Search Engine Ready is the kind of website design that enables search engine spiders to examine and index its content. Why is it Good?The Search engine friendly design implies that the website will be properly indexed and ranked higher by Google. Newest Search Engine Friendly Magento ecommerce templates here Magetique - Bikes Magento Theme FAQ I would like to purchase Magento ecommerce theme for Motorbike Store, but it is not available on the site anymore.The Magento ecommerce theme for Motorbike Store has been sold out for exclusive price or discontinued.As technology inevitably develops, TemplateMonster may discontinue the production of certain products. It can be no longer available for sale because of being outdated.What is a buyout purchase license for Magento design for Motorcycle Parts Retailer?If you purchase the product at a 'Buyout price' it guarantees that you are the last person to buy this template from us. It means that this Magento design for Motorcycle Parts Retailer may have been sold before a couple of times (see 'Downloads' number in item's properties) but only you and people who bought the template before you will own it. After this kind of purchase the template is being permanently removed from our sales directory and is never available to other customers again. The buyout purchase license allows you to develop the unlimited number of projects based on this template, but the template should be customized differently for every project.Are your Sports Magento ecommerce themescompatible with any CMS?We do not guarantee compatibility with any CMS. Please make sure to check the product description in order to find out if this product is compatible with certain CMS.Is it reasonable to make unique purchase of Magento template for Biker Club Apparel Shop that was already purchased before?Yes, it's reasonable to make a unique purchase of Magento template for Biker Club Apparel Shop. Because there is very small chance that you will find the same design on the net. There are more than 3,000,000,000 webpages online now according to statistics on www.google.com.I would like to make payment for Chopper Club Magento template by company check. Is that possible?Please use Skrill payment option. They accept payments by check.You can place an order for Chopper Club Magento template on the site under the name of the company and choose Skrill merchant system for making payment from the company's account. To initiate bank transfer, please create an account here - www.skrill.com, add the number of your bank account and verify it. After that, you can place an order on our website and choose Skrill on checkout page. When the payment is made, the product will be sent to your e-mail along with the invoice under the name of your company.Can I resell the Magento design for Motorcycle Gear Shop as is?No, you cannot resell the Magento design for Motorcycle Gear Shop as is.Will TemplateMonster help me to edit my Magento template for Motorbike Accessories Shop?TemplateMonster offers you a variety of sources to help you with your Magento template for Motorbike Accessories Shop. Use our comprehensive Online Help Center to get the basic knowledge about your Magento template for Motorbike Accessories Shop. Our Knowledgebase contains customers questions and most frequent problems. Anyway, you can always use TemplateMonster 24/7 phone support, try our Ticket System or Live Support Chat to get qualified assistance from our support representatives.Can I put a line at the bottom (or any other spot) of my new product "Website development by Company name" after purchasing Magento design theme for Bike Parts Shop?Yes, you can place a note at the bottom (or any other spot) of my product "Website development by Company name". Nevertheless, you cannot place "Website design by Company name" while using one of Magento design theme for Bike Parts Shop.Can I contact the Magento ecommerce template for Sports author?Yes. You can contact this Magento ecommerce template for Sports author/author's team directly using your personal account under the Support tab.Can I integrate the Magento ecommerce theme for Motorbike Parts Shop with third-party software or applications for development of my new products?No, you cannot get the developers license for development of Magento ecommerce theme for Motorbike Parts Shop or other products.What is a unique purchase license for Magento ecommerce template for Motorcycle?If you purchase the product at a 'Unique price' it guarantees that you are the first and the last person to buy this Magento ecommerce template for Motorcycle from us. It means that this template has not been sold before and you become an owner of a unique design. After this kind of purchase the template is being permanently removed from our sales directory and is never available to other customers again. The unique purchase license allows you to develop the unlimited number of projects based on this template, but the template should be customized differently for every project.I like the image from the Sport Teams Magento design theme and would like to use it for my advertising campaign, can you send me this image in a higher resolution?No, we can't provide image in higher size or resolution rather than it is on the Sport Teams Magento design theme. We recommend looking for professional images on online photo resources.Can I put a line at the bottom ( or any other spot) of the customized Magento ecommerce template for Cars News "Website design by Company name"?No, you cannot place a line at the bottom ( or any other spot) of the customized Magento ecommerce template for Cars News saying "Website design by Company name". Nevertheless, you can place "Customized by Company name".Can I get the Bmx Store Magento theme in higher resolution to use for printing?No, we design Sports Magento design themes optimized for web resolution only.Is it possible to buy the particular image from the Magento design theme for Bmx Lessons?No. According to our Terms and Conditions we never sell the images separately from Magento templates for Cars Blog (as well as the templates separately from the images).What is the difference between unique and non-unique Magento ecommerce theme for Motorcycle Club purchase?Non-unique purchase:Non-exclusive purchase means that other people can buy the Magento ecommerce theme for Motorcycle Club you have chosen some time later. Unique purchase:Exclusive purchase guarantees that you are the last person to buy this template. After an exclusive purchase occurs the template is being permanently removed from the sales directory and will never be available to other customers again. Only you and people who bought the template before you will own it.What is Developers License for Magento design for Cars?If you purchase a Developer's license, you are granted a non-exclusive permission to use the Magento design for Cars on up to 5 domains for projects belonging to either you or your client.What am I allowed and not allowed to do with the Bmx Website Magento templates?You may: Build a website using the Motor Bike Club Magento ecommerce template in any way you like.You may not:Resell or redistribute templates (like we do).Claim intellectual or exclusive ownership to any of our products, modified or unmodified. All products are property of content providing companies and individuals.Make more than one project using the same template (you have to purchase the same template once more in order to make another project with the same design).I was billed for Magento template for Bmx Store twice – I received 2 emails from merchantMake sure that these charges for Magento template for Bmx Store have different order IDs. If it is so, contact our billing department.How can I modify Magento design theme for Сѓycling to suit my particular website?Please visit our Online Help Center to obtain detailed instructions on editing Magento design theme for Сѓycling.Is it possible to use your Cars Magento ecommerce themes to develop websites for my customers?Yes. It is perfect for designers who want to offer their customers a high-quality design and also save time and money. Keep in mind that when you purchase the Magento theme for Bike Store with ordinary or exclusive license you're entitled to create only one project (one domain name).What will I see instead of the images after installation of the Magento design theme for Motorcycle Club Store?After Magento design theme for Motorcycle Club Store installation you will see blurred images included for demo purposes only.Can I customize the Motorcycle Magento design theme if that's required by application settings?Yes, you can customize the Motorcycle Magento design theme code, graphics, fonts to any extent needed.